This simple mantra always plays in the back of my head when it comes to what we publish, but it’s becoming louder and louder these days – as the noise around content marketing becomes louder as well. I love content marketing, and I truly believe that – when it’s done well – it’s great for your customers and a fantastic way to build and grow a business. But, I’m also tired. Tired of similar advice. Tired of marketers dialing it in to check a box. Tired of too much me-too or meh content. Please don’t get me wrong. I’m not coming from a place of having all of the answers – and I’m fighting with several of these issues, too. But to grow as marketers – and to really move the business forward with content (which is why we are doing this anyway, right?) – we all can benefit from thinking beyond the usual platitudes and ideas. What’s going wrong – and what can we do? My intent is to give you things you may not be thinking about. Answering customer questions is a solid strategy for beginners, but it’s not ideal in every situation, especially in a more crowded content niche. In that situation, you need to focus on insights instead of just answers. Insights instead of answers. I adore this sentiment because not only is it a dig-deeper approach in which you can create the 10X content that Rand Fishkin talks about, but it’s also something that only you can offer. It comes from your point of view instead of a regurgitation of what has been published. Think about what only you can offer. Your Brand Needs a Point of View, But Do You? I’ll bet you personally have too much noise in your life. There is so much talk about the need to unplug from work, and I am a huge proponent of that. But, you need to do more than replace one type of media for something else. When you are browsing Facebook, checking personal email, or watching Netflix, your mind shuts off from work, but it’s not really shut off. While there is nothing wrong with fun reading and other entertainment, I have been challenging myself more by shutting off everything and getting comfortable with quiet. (Yes, getting comfortable – it can be unsettling to be tethered to nothing.) When I find that space for quiet, I find my thinking truly does improve, and I’m more at peace. How much truly quiet time do you have? If it’s not a lot, what can you shut off to get comfortable with quiet? I was recently asked about my biggest challenges as a marketer. While I have several, the one I chose to reflect on is that our team is drowning in ideas. While I’m glad we have so much to cover, I have found this glut of ideas to be a negative for a few reasons. First, if you are working on something, you need to give up – or push back – working on something else. And this can be tough if you love a lot of your ideas (as many of us do). Suggestion: Choose something and commit to it. Don’t get stuck in the trap of thinking about what you aren’t getting to and instead focus on the movement you are making. A second issue when you get stuck when you are working on something is that it can feel easier to move on to something new because there is plenty to choose from. It’s easier than bearing down and doing what is difficult that stands right in front of us. Suggestion: Have one or more gut-check people who can tell if you’re going in the right direction or suggest another approach if things aren’t working. For instance, I shared the first draft of this post with one of our editors, Ann Gynn. She told me the piece wasn’t clicking for her and gave me some advice on how to reframe this. While I initially considered moving on to another piece, I stuck with this one but looked at the issue in a different way. You need these honest and insightful people in your life. The last issue is simply the time it takes to wade through and prioritize what we, as a team, should focus on. It’s conversations and phone calls about talking about what we can do instead of doing. Suggestion: I tackled this topic a few months ago in a post called Get Control of Your Content Marketing Ideas So You Can Take Action. Add to this the consistent pace and daily deadlines, the constraints on our time, constant distractions, and it’s easy to become unfocused, burnt out, or frustrated – which, quite frankly, can show in the work we do. While we have not yet implemented Agile marketing as a team, I am so intrigued with this approach to marketing – and it’s coming up in so many more conversations these days. Recently I even talked to a marketer, Eva Johnson, who started an Agile marketing meet-up in Indianapolis, which, to my surprise has more than 100 participants. In short, Agile has so much potential as an approach to help the team get a shared understanding of what to do – and then do it. Here is a great primer from Andrea Fryrear on the basics of Agile marketing. I recently talked (OK, ranted) about my frustration with the sentiment, “I have a strategy – take a look at my editorial calendar.” If you don’t think there is a difference – or if you think the difference is in semantics only – please take a few minutes to read that post. 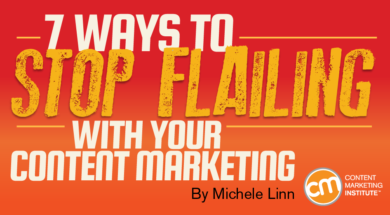 Many marketers conflate content marketing with getting leads. While leads are essential for many businesses, I worry that marketers aren’t appreciating the value of truly building an audience whom they can help over the long term (and, who, of course, will help your business). Instead of thinking about leads, I urge you to think about subscribers. Leads give some information in exchange for a piece of content or something else. They may or may not be interested in your products or services. Chances are, they don’t want ongoing communication from you. On the other hand, subscribers sign up to receive regular communication from you because they think you have something valuable to say – and that you’ll continue to have value. They sign up because they want what they anticipate you’ll provide. While changing your mindset from subscribers to leads is a great first step, I challenge you to take this even further. During his ICC keynote talk, Robert Rose explained that he considers two types of email addresses: gathered and given. Given is data given freely because people want to hear from you. Gathered data is far less useful because it’s emails given to get that one-time exchange – but they are often false (or, at the very least, they turn into unengaged subscribers). Are you spending too much time and energy around which assets to gate so you can get leads? Or, are you thinking about how you can provide something consistently that’s so valuable that people would miss it if it were not there? Granted, these authors typically do not have advanced content marketing experience that would benefit our readers, but no matter who the author or what the topic, this exchange-request approach is an absolute turn-off. While I understand the value of guest posting at authoritative sites, if your main focus is getting a backlink to your site, the article already seems insincere. In short, don’t publish or guest blog to get links. Be helpful and be genuine – and know that rewards come in other ways than backlinks. Fine isn’t fine these days — and I think people should try to be better than that. For last year’s content marketing predictions, I talked about resonance, which was a theme I heard repeatedly at Content Marketing World. Unlike useful, usable content (which is, well, useful), resonant content moves the person to do something, to take action. It could be an action that benefits your business – such as becoming a subscriber or purchasing your product – but it could also be something that you never see – such as retooling a process or changing their approach to something based on what you shared with them. I challenge you to define what quality means to you – or simply get rid of that word altogether – and figure out how you can create meaning. Over to you: Are you seeing similar issues? What else would you add? Want one more way to stop the flailing? Plan to attend Content Marketing World for expert insight, frustration venting, and even some silence away from the office. Register before June 2, 2017 for early-bird rates. Use code BLOG100 to save an additional $100.